The Farm Between grows organic fruit on trees and shrubs. Today we’re calling it biointensive fruit, because that sounds really good and we think it's fitting. John and Nancy Hayden use the term agroecological. The pollinators have it made at their farm, and the fruit is nutrient-dense and packed with flavor. Currently, they produce apples, pears, black currants, plums, beach plums, raspberries, gooseberries, and more. They mulch everything with loads of organic matter, and their business is profitable on all levels. Polaris, the North Star, stays put in the night sky, while the other sidereal bodies appear to move around it. Nancy was a long-time professor of civil engineering at The University of Vermont, with a focus on water and soil restoration. John was also on the adjunct faculty and has an MS in pomological entomology, i.e. insects that associate with apples. They were both Peace Corps Volunteers in Africa and raised their four children at the farm. John played Lacrosse at Syracuse, and went on to coach at various colleges and high schools in Vermont. John has since gone on USAID Farmer-to-Farmer exchanges to The Dominican Republic, and has taught classes in Cuba, and Mexico. The Haydens also ran non-profit that set up community and school gardens in the Dominican Republic and Haiti. They’re hard-working, optimistic folks who make us feel like today is a great day to be alive. The Haydens bought the farm in 1992, and it has since gone through various iterations. They started out as multi-species graziers with a flock of 50 sheep, and raised 1000 pastured meat chickens per year, along with pastured rabbits, hogs, and turkeys. They then moved on to growing organic vegetables, selling through a CSA and a farm stand. Two draft horses powered the vegetable operation: the horses cut down on their physical labor, but continue to keep the grass down and supply fertilizer to the fruit trees and shrubs. In 2011, John and Nancy took steps to increase their resilience by focusing on perennial fruit production. Part of what was once a 300-acre dairy farm, The Farm Between is situated on 18-acres in Jeffersonville, Vermont. The trees and shrubs themselves, however, occupy less than 4 of those acres. Jeffersonville gets 42 inches of rain per year, and 169 inches of snow. Their average annual low is -30 degrees fahrenheit (zone 4b), and winters stretch from Halloween through to the end of April. 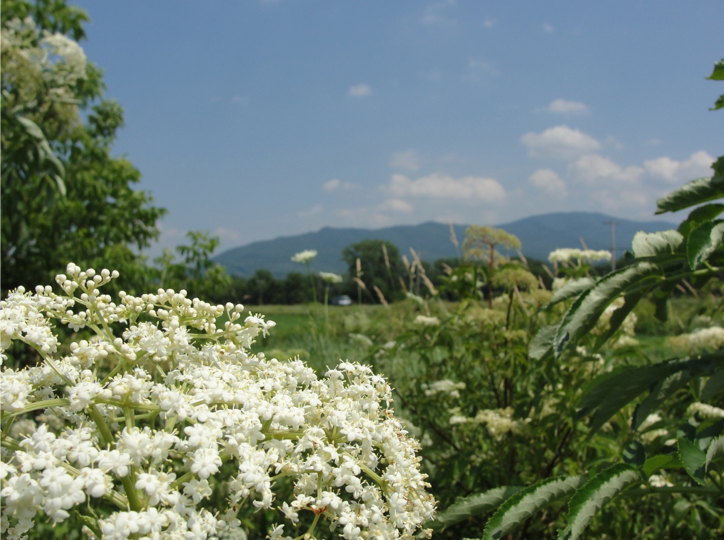 At 44.6 degrees north latitude, summers are warm but not hot, and cumulative heat units are low: the short summer rush of green in the mountains of Vermont matches up with quick-to-fruit shrub crops such as currants and blueberries. On the banks of the Lamoille river, the soil is a silty loam. The farm occasionally floods, but the trees and soil stay where they are, thanks to the permanent ground cover that is grass and woody plants. The Farm Between in the spring of 2017 - Across the street is a conventional cornfield before planting. Can you guess which system is more regenerative? The Farm Between in 1992. Note the erosion on the hillside. FDR once said that "a nation that destroys its soil, destroys itself." Globally, cropland loses 10 tonnes of soil per hectare per year, which amounts to 250 5-gallon buckets per acre. This results in trillions of dollars in lost yields, but let's look at the bright side. We know how to fix things like this, and the solution involves trees. As ecologists and entomologists, John and Nancy Hayden are very intentional in creating habitat for honey bees, native pollinators, and a whole host of beneficial insects. Honey bees often get all the credit because they produce honey, but the native pollinators such as mason bees and bumble bees do the real heavy lifting. They will work in the cool and rainy weather that often occurs during fruit-tree flowering. Nasturtium-covered hugelkultur, along with wooden nests filled with sumac and Japanese knotweed cuttings house the bees. Think bird houses, but for bees. A pollinator pathway, i.e. a wildlife corridor for insects, stretches along the creek, from the adjoining woodland to the central part of the farm. These insects are a direct substitute for synthetic pesticides: a whole host of insect pests eat apples and other tree fruit, but each insect has a predator of its own. One must ask, “which insect eats the insect that is eating my fruit?” At The Farm Between, the mason wasps that also inhabit the bee boxes fly out to the apple trees, and bring back the caterpillar pests to feed their young. Such a knowledge and implementation of deep ecology is truly remarkable. The elderberry flowers keep the bees busy in June and July! With a diversity of fruit comes a diversity of flowering windows. Bee death is a serious issue in the almond plantations of California: among other reasons, everything flowers at once, due to low biodiversity, and the bees are left without food. What does the farm grow? Nutrient-dense fruit is the name of the game. The Farm Between sells fresh fruit such as apples, pears, blackcurrant, red currant, blueberries, raspberries, honeyberry, and gooseberries wholesale. Elderberry, aroniaberry and beachplum are used to accent ciders and syrups. The Haydens grow a small number of dwarf peaches, apples and plums in high tunnels. The hardy kiwi vines are going strong but have yet to fruit. Blackcurrants are packed with antioxidants. They were once banned in many states, because some varieties carry white pine blister rust, which threatened the timber industry. Consequently, many Americans have lost a taste for them, but Europeans are quite fond of them. Varieties that don't carry white pine blister rust are now widely available. 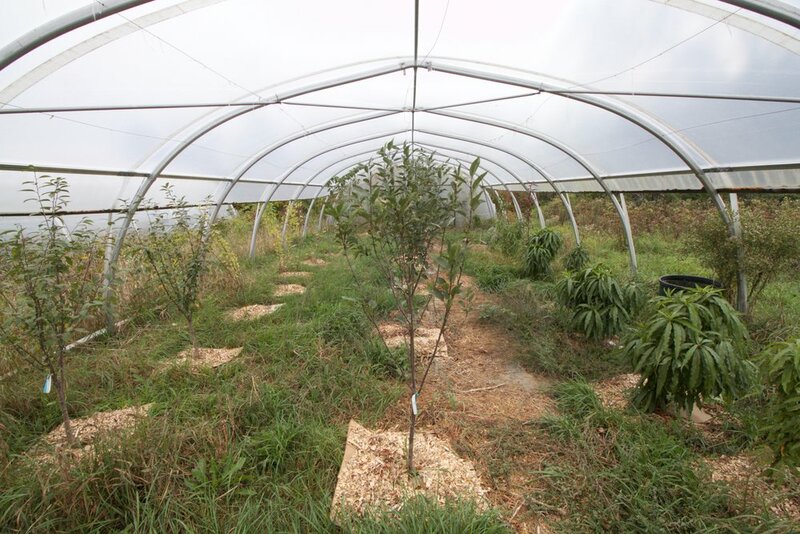 High tunnels extend the growing season of dwarf peaches, nectarines, and apples. 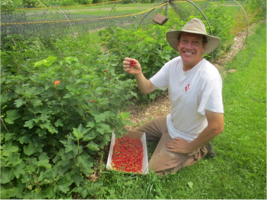 The farm also grows raspberries in high tunnels, which can out-yield tomatoes as far as profit goes. What cash-flows the farm right now? Nancy and John are big on 'value-add' as a way to use all of their fruit and maintain cash flow during the winter. Their main sales channel is The Burlington Farmers Market, and they sell most everything at retail prices, direct-to-consumer. They offer bottles of elderberry-ginger syrup, along with jars of sweet cider and jam. Their “raspberry fridge jam” is not canned in a hot-water bath, and when eaten fresh is just like Jim Morrison: it’s the greatest thing ever, and it’s gone way too soon. At the summer markets, shaved-ice topped with syrup makes for snow cones, and hot cider graces the market in winter and fall. The Farm Between also runs a retail fruit-tree nursery. They sell most all of the trees and shrubs they grow themselves, in pots. The quality of their plants is superb. Vegan down jackets, you say? Milkweed is a perennial that grows up in abandoned pastures. The seed pods contain wispy white fibers that insulate even when wet. This natural material can be used for jackets, and the farm once sold it by the pound to a Canadian company that makes clothing for their Coast Guard. Traditional goose down is harvested by de-feathering a goose while it’s still alive, so the vegan crowd is largely turned off by it. Synthetics are a substitute, but are far from innocuous. Every piece of plastic that has ever been made, less it was burned, still exists. Much of it has photo-degraded into microplastic, which fills the oceans. We’ll spare you the details. Milkweed is a natural plant-based insulator that will decompose back into the earth at the end of its useful life. John and Nancy also sell milkweed seed for conservation purposes like establishing ground-cover on clear cuts. Creativity is a mainstay of The Farm Between. 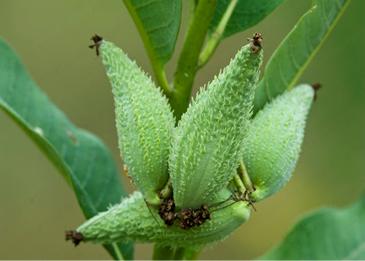 Milkweed seeds grow in pods, attached to wispy strands of ready-to-use fiber that insulates even when wet. The terms deep organics, regenerative agriculture, perennial polyculture, agroecological, and permanent agriculture could all characterize The Farm Between. Biointensive vegetable farming is all the rage right now, with farms such as Les Jardins de La Grelinette, La Ferme des Quatre-Temps, and Green City Acres growing both great vegetables and great media. Biointensive vegetable production focuses on high-quality, high-value crops that are often sold directly to consumers. Farmers do nearly all of the work by hand, and with two-wheeled walk-behind tractors to work low-till and no-till permanent beds. Nutrient-dense, great tasting vegetables result. Here we use the term “biointensive,” because The Farm Between does not till, and intentionally manages their trees and shrubs with hand labor. Horses turn the grass into manure, which after being composted, John and Nancy spread below the trees and shrubs. The name of the game here is to add organic matter to the soil beneath food-producing plants. The farm imports some wood chips, and others come from the box elder, silver maple, and sumac on the farm. The soil is high in organic matter at 6% across the entire farm, with much higher percentages below the market crops. The goal of organic farming, and really of human existence, is to turn sunlight into fertility and nutrition. Nancy and John Hayden turn wood chips, water, and sunlight into currants. Though we at Propagate are mainly focused on broad-acre agriculture, we’re of the mindset that food should be produced in proximity to those that are going to eat it. The Farm Between is ecologically complex, but conceptually replicable in yards and farms across suburbia and peri-urban areas. 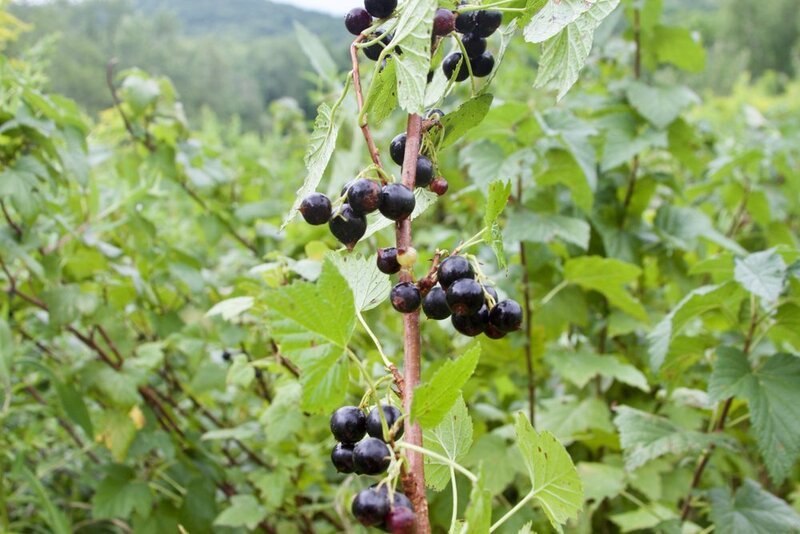 Their 500 blackcurrant bushes could be scaled down into a yard of less than one acre. Much of suburbia, filled with these 1-acre yards, buys industrial fruit and berries from Oregon and California. A re-localized food system would have these spaces turning sunlight into fruit. The Farm Between could also scale up to 5,000, or 50,000 bushes with additional labor, but John and Nancy only wish to produce enough to support themselves. So what’s next for John and Nancy? They are writing a book about their 25 years of farming experiences. Additionally, what is next for the rest of us? Are we going to look on as observers, or put our hands in the soil and plant some currants? Photosynthesis is a beautiful thing, so let’s make trees happen. Propagate Ventures is on the road to scale agroforestry into a cornerstone of agriculture, and push regenerative agriculture forward as an asset class. We work with farmers and land managers to identify opportunities for tree-crop installation, based on their short and long-term goals. We match those opportunities with investment capital, thus providing a turnkey solution for adding trees to farmland. Trees sequester carbon, clean our air and water, mitigate soil erosion, increase biodiversity, and stabilize the planet’s climate. AT Propagate, it is our responsibility to heed the word of organic farmers with 30 years of experience, and we hope you can glean good ideas from the information we share. John, along with Propagate Ventures co-founders Ethan Steinberg and Jeremy Kaufman.